Welcome to this beginners introduction. You are probably one of these types of people. You're interested in setting up an aquarium and want to do it right. You've just set up a tank and are interested in knowing more on this fascinating subject. You have or will be buying a tank for your son or daughter to keep. You're wondering why your aquatic animals keep dying on you? Keeping fish or any of the other aquatic animals that are available to you has never been so easy compared with even a few years ago. This is a massive hobby and has been going on for hundreds of years. It may surprise you to know that today more people keep fish as pets than dogs or cats. So welcome to the hobby! The goal of this article is to teach you the basics. Occasionally this will mean learning a little science. But it's been kept to just the basics. Honest! One point, just to be clear, while this article may talk about fish, this being the most popular animal to keep in an aquarium, it isn't the only choice open to you. Some keep frogs, shrimp, turtles or even snails in their tank. So this article equally applies to keeping all of the above. A successful aquarium is a tank containing healthy animals, perhaps with some plants, that thrive for many years and perhaps even give you that extra pleasure of producing babies! Sure there are a couple of potential pitfalls to look out for and we hope to outline them as we go along so you can neatly sidestep them. The guidelines you'll find here are based on proven science and on the many years of experience of aquarists across the globe. You will no doubt have different ideas on how to progress once you've learned the basics. But that the beauty of this hobby, everyone's tank is unique. You'll be surprised at how many there may be near you. Best to look in the local telephone directory or ask at the local pet shop. As you visit them, take a pen and paper and note down the names of the animals you like. The shopkeeper is used to customers asking questions so fire away, but don't take every word as gospel, some employees are more educated in fishkeeping than others! Garden centres are also good places to find aquatic retailers, often hidden away in a back corner. Often you'll find the centre has an aquarium section as people like to keep Goldfish and Koi fish in their garden pond. Pitfall: Just be wary that they may not have your best interests at heart. There are bad shops and good shops in all manner of businesses and the aquarium hobby is no different. The good shops look clean, win awards and proudly display these. So take a note of those posters! Some will be members of the OATA (in the UK) which means they've agreed to follow guidelines on looking after the animals in their shop and provide customers with good advice. Pitfall: You'll be very tempted to buy items like the tank and fish on the same day (especially if you're a parent with a eager child in tow). But think of it as a exploration trip rather than a buying trip. Buying a tank and a fish on the same day for a beginner is usually a fatal disaster for the animal and a waste of your time and money. If you're worried about this, don't take your wallet to avoid temptation! Many good aquatic stores refuse to sell fish and tanks at the same time, this is for your benefit! You'll need to find a place to put a tank. You're advised to put a tank where you can see it comfortably. Sounds obvious we know. But if a problem happens then you're not going to see it for hours if it's in 'the other room'. Best to put it against a wall so it can't easily be knocked over. Most aquariums need one or more mains electrical items to be used in it. So keep in mind that access to a wall socket is required. Pitfalls:You don't want to put one on a shaky table. A full aquarium can weigh a surprising large amount and putting it on a dodgy table is an ugly accident waiting to happen. Similarly don't put an aquarium near a busy door. This will stress the animal and a stressed animal is an ill animal. Don't put a tank against a sun drenched wall. Too much sun shining on the tank causes algae to grow in the tank which can soon look ugly (the fish don't mind it though) and the sun can easily heat up the water to killing levels on hot days. Lastly, think about you cleaning the tank and replacing the water from time to time. If the tank is too far from the bathroom or kitchen then you'll be giving yourself extra work carrying equipment and water around the house. Difficult one this. There are currently dozens of different tanks on the market. They are all manner of sizes, colours and shapes. Some are gimmicks sold by manufacturers to make a 'buck' and are unsuitable for holding a fish for any length of time. So what makes for a good tank? Usually the cheapest ones surprisingly. A long, low, rectangle shaped tank is still the best shape. It's sturdy and doesn't cost much to make. There are two basic types: Those made out of glass or those made out of plastic (Acrylic). Each have their advantages and disadvantages but glass is generally better in the long run as it's easier to keep clean and gives the best view of the fish. You'll want one with a hood. This will house the lamp so you can view the fish at its best and will keep smells and the fish in and reduce water evaporation. A good tank will have a large surface area. That is the amount of water exposed to the air relative to the volume. It may surprise you to know that it's not just the amount of water a tanks holds that determines the number of fish it can house. Most important is the surface area. Fish need oxygen to breathe and they can only get this by the air diffusing slowly across the water line. So the larger this is, the more oxygen can get into the water to replace what the fish take out when they breathe. This is why people with goldfish bowls should only half fill them as that maximises the surface area. Not that we recommend using such small bowls of course. Their lack of filtration and small volume usually ends in a sick or dead fish. A lot of tanks come with their own stands. This increases their cost but you do get peace of mind that the stand is able to support the weight of the full tank. Most stands are also cupboards and provide a useful place to store bits and pieces, including external canister filters. Buying a tank, setting it up and filling it with fish all in the same day, while possible, is a sure road to disaster if you don't know the tricks of the hobby. In fact, setting up and fully stocking your first tank can take close to a month! But we'll show you how to do it in a day. Tank liner. A sheet of foam that is placed under the tank to protect the furniture and to stop any piece of grit from pressing into the bottom glass plate. A heater to keep the water warm (for tropical set ups only). A filter to remove toxins given off by the fish and keep the water chemistry stable. Water chemistry test kit, liquid kits are more reliable (testing for ammonia,nitrite,nitrate,KH,pH, GH). Two clean plastic buckets - one for holding new water, one for the old. Substrate of your choice, gravel or sand. Plants. If you've got plants you'll need some plant fertiliser. Fish (or any other aquatic animal) require a place to hide so you'll need to provide some objects like plants (real or plastic), rocks, bogwood, ornaments, etc. Avoid any décor with very small holes where a fish could get stuck. Once the animals feel at home, they'll come out more if they feel they have a retreat. Examine the tank carefully. Any cracks or bad workmanship need to be found at this stage. Lightly wipe the inside with a dry paper towel to remove any dust, etc. or use a vacuum cleaner. At no point use any kind of soap or detergent on the tank or equipment or ornaments. You may kill the animals if any slight trace remains. A rinse of the tank with warm water is a good way to get rid of any shop dirt. Take the gravel and rinse it in tap water to remove dust. You'll need enough to cover the entire bottom of the tank to a depth of 2.5cm (1"), only go deeper if you have live plants. Add the ornaments and position these firmly down in the gravel. You need to make the water around room temperature 22-27°C (71.6-80.6°F) before you add it to the tank. Use water from the kitchen tap only, it needs to come straight off the mains. Water that has been stored in storage tanks for a long time can contain bacteria or other nasties (dissolved metals), this can include hot water. It is best to use a spare heater to warm up standing water than hot water from the hot tap. A good tip is to place a small china saucer in the bottom of the tank so that any water poured in will hit this first and stops the gravel from being displaced. Pour in enough to cover the gravel to a depth of an inch. Take your water conditioner and reading its instructions, pour in enough to suit the total volume of your tank. Now add your plants (alive or plastic!). Once you're happy with this, fit your heater at an angle to the side of the aquarium adjust it so it's not touching the gravel, if it is a submersible one, or clamp it to the rear edge of the tank if it not. Add your box filter and arrange the cables. Fill the tank to the required level and put the lid on it and turn on its lights. Switch on the filter and the heater, and adjust it so it just barely comes "on" to start with. You'll notice millions of tiny bubbles appear inside on surfaces, this soon clears after a few hours. This is normal. Leave the tank to settle overnight, or at least for a few hours, as you should really check there are no leaks. Now comes a bit of science. If you place aquatic animals into water then they will make mess in the water. This waste product is ammonia, a deadly, foul smelling, very toxic form of nitrogen liquid. In the wild it is diluted in the river or pond. But in your small tank it isn't and so it rapidly builds up in a few days to levels that will kill your pet. Fortunately there are ways to get rid of it. You can add a filter. The pump constantly moves the aquarium water through the sponge. On the sponge will grow bacteria, a kind of brown slimy mess, which is naturally present all around us in nature but grows best, very conveniently for us, in water when fed a food source like ammonia. The bacteria are initially very low in number and so can't do much to begin with but as it eats the ammonia, the ammonia level will drop. Eventually it will grow to such a size that it is able to consume all the ammonia your animals excrete. This process takes a week or two, however, and longer in marine systems. The bacteria takes in the ammonia. But like all life, they too excrete waste. This waste is a chemical called nitrite, another form of nitrogen. This waste is a little less toxic than ammonia (about 6x times) but still deadly if it was to get to a high level. Lucky for us again, another species of naturally occurring bacteria is always present around us and this 2nd bacteria eats nitrite and excretes nitrate waste. Once more it take time for this second type of bacteria to grow to such an amount that it can consume all the nitrite being produced. This takes around another week or two (longer for marine again) after the first lot of bacteria starts making nitrite. 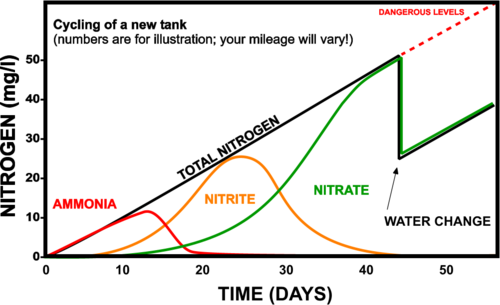 Nitrate is far, far less toxic than the other two chemicals (over 30,000x less toxic than ammonia) and only builds up slowly so we can get rid of this by performing partial water changes every week or two or adding lots of plants as they can eat nitrate. This whole process, which every tank has to go through, is called 'Cycling' or 'Tank Cycling'. When the ammonia and nitrite levels are at zero then your tank is said to be 'cycled' and safe for your pets to live in. Here is a graph showing the progress over time of the levels of these nasty waste chemicals. PITFALL: To make the bacteria grow you need something in the water producing ammonia. No animals in the water = no ammonia and no cycle! But if you put fish in the new tank then you would kill it with its own waste. So what aquarists did for years was add one or two small fish which they knew could withstand a level of ammonia and fed them lightly. This produced the ammonia but is now considered unethical in some countries as better methods exist today which does not harm life. Some people add fish food which slowly decays over the weeks but again this is messy, slow and unreliable. 1. Constantly changing the water so as to dilute the ammonia or nitrite. But this delays the cycle process as the ammonia eating bacteria is denied food so can't grow as fast. 2. Adding a handful or two of gravel from an established aquarium. There will be a small amount of the bacteria on them and this helps seed the new aquarium. But it doesn't speed up the cycle time by more than a week or two. 3. Using a filter with a sponge, you find someone with an existing cycled aquarium and smear its filter bacteria onto your new sponge and put the treated sponge into your own filter. This needs to be done quickly as the bacteria dies within an hour or two out of oxygenated water. This hastes the cycle process but not more than a week or two. 4. You treat the aquarium with a ammonia and nitrite neutralising chemical (Prime by Seachem or Amquel+ by Kordon is often used) that de-toxics them without removing. You need to do this daily and not over (or under) dose the tank. You continue the treatment until the levels of ammonia and nitrite reach zero. This takes up to 30–40 days. 5. You add a small level of pure ammonia every day for up to 40 days and monitor the levels of ammonia with a test kit. When the ammonia starts to decrease and nitrite appears you know you're getting there. When ammonia and nitrite are at zero and nitrate appears the tank is cycled and ready for you to add fish. This takes at least a month and is one of better fishless methods to use. Today there is a better way - The 'hi-tech' cycling method. You buy bacteria in a bottle which when used as instructed will allow you to add your fish to the tank within 24 hours or less of setting up the tank! No more waiting for a month or more. By also adding a small dosage of Prime or Amquel+ each day for the first 7 days, you also ensure any uneaten ammonia or nitrite will not harm your fish in anyway. The result is a fully cycled tank within a week and healthy fish every time! PITFALL: There are several bacteria seeding products which use the wrong species of bacteria and do not allow the immediate addition of fish. These are easy to spot, they don't claim you can add fish right away. They do reduce the cycle process by a week or two at best but not dramatically. See our article Bacteria bottles, do they work? Once the tank is fully cycled you can add livestock. But you must remember to only add a few animals per week as the level of nitrifying bacteria will have only grown to the limit of the amount of ammonia being produced. When you add further animals, then there will be free toxic ammonia in the water for the first few days until the bacteria grows to match the new level. So feed sparingly, healthy animals (not the very young) can take going slightly hungry for a week with no side effects. Alternatively continue to add a water conditioner like Prime or Amquel+ daily until the ammonia is gone. You can measure the levels of the three toxins (ammonia, nitrite, nitrate) any day by using test strips, or more accurate liquid test kits. Tests strips are small paper strips that are dipped into the water for 5 seconds and can indicate when the cycle has completed. The liquid-based test kits are more accurate, but more time consuming. For this reason test strips can be very handy for the early days when testing is being done every day. So use them daily for the first 30 days so you can monitor the progress of your tank. Keeping a record of the indicated values is a good idea for identifying your place in the cycle. A completed cycle is indicated when ammonia and nitrite read zero and you have some nitrate. See Beginning Fishkeeping-Choosing your first Fish on the subject of selecting fish. Also this article assumes your water is reasonably 'hard'. If you know your water is very soft then you'll need to take special precautions to ensure your water is a little bit harder. Add a small handful of coral sand per 19 Litres (5 US G.) or add a teaspoon of plain bicarbonate of soda per 19 Litres (5 US G.) to get the KH value above 4dKH (~70 ppm). You can purchase a KH test kit at your local aquarium shop. Don't dump plain bicarb into a populated tank - dissolve it is some tank water and then gradually add it, at later stages fully dissolve in the new water being added at water changes. This is to prevent the pH from dropping too low (becoming highly acidic) as biological waste decays. This page was last edited on 25 July 2012, at 20:56.